Captured, taken from her beloved family and woods, Aria’s biggest fear is not the imminent death facing her, but that she will be chosen as a blood slave for a member of the ruling vampire race. Aria’s world is turned upside down when a vampire named Braith steps forward to claim her. He delays her execution, but Aria knows it’s only a matter of time before he drains her, and destroys her. Aria is determined to hate the prince, but his strange kindness and surprising gentleness astonish her. Torn between her loyalties to the rebellion, and her growing love for her greatest enemy, Aria struggles to decide between everything she has ever known and a love she never dreamed of finding. Though she is free of the palace, rescued from her position as a blood slave, Aria is haunted by the memories of Braith, the prince that betrayed her and shattered her heart. Every day is a struggle to get through, and the only solace she can find is with Max, her best friend, and fellow captive. Aria slowly begins to salvage the broken parts of her wounded spirit by throwing herself into the wonder of the woods she had so greatly missed. Her world is thrown into a tailspin again though when a marauding group of vampires destroy the caves she had found temporary shelter in. Scattered about the forest, seeking to stay hidden and find her family, Aria is stunned when Braith, the monster that savaged her heart, reappears. Aria is fearful of entering into the land she’s heard nothing but cautionary tales about, but she’s determined to help Braith locate the vampires that may help them with their cause. She is fascinated and amazed by the world they uncover within. However, the more immersed they become in a world, the more she realizes that it won’t be the war or even the king that will eventually tear her and Braith apart. It will be her. Tormented by the loss of Aria, Braith is forced to choose between his need to rescue her, and the impending rebel war he’s been chosen to lead. Fighting against the darkness which threatens to drag him into its tempting depths, Braith struggles not to become the one thing he hates the most, his father. Faced with their separate challenges, Aria and Braith must come to terms with who they are, what they want, and the likelihood that they can never be together as the inevitable war looms on the horizon. A war that all of them will fight but not all of them will survive. A year has passed since the war against Jack’s father. Having left the palace behind to ensure that the outer towns are obeying the new laws, Jack struggles to come to terms with the grief that drove him from the palace in the first place. That is until he encounters Hannah. 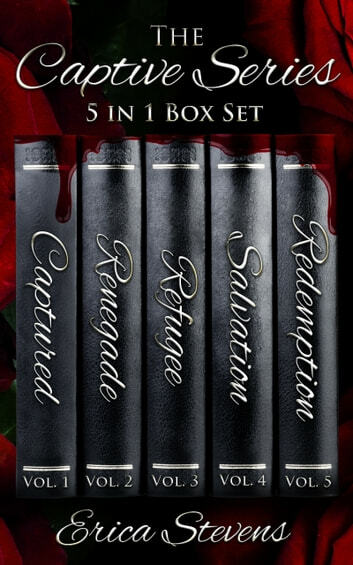 Recommended reading order for The Captive Series. Mature YA/New Adult. These books contain some language, violence, and sexual situations. Recommended for ages 16+. Erica had me drawn in to the book from the beginning! I couldn't put ANY of the books down in the series! Definitely a passionate, sassy, exciting vampire love story. A must read !! LOVED this series. Highly recommend! can not say enough about this series. I had downloaded the first book, Captured, when I saw it for free on one of B&N's specials. I read the first book in about three hours, and read the rest of the series in less than a week. I not only discovered a great series, but an incredible author with other series/stories I couldn't put down. This series focuses on a decades long battle between humans and vampires. Vampires now rule the world, and treat humans as nothing more than slaves or their next meal. When Braith, the future vampire king, comes across Aria, a human who has been captured and is being auctioned off as a blood slave, a shift in the world he knows occurs. Braith, who is blind, can actually see Aria. There is something undeniable between them, and against all his better judgement, he takes her as his blood slave. Aria is royalty in her own right; daughter to the leader of the humans, and a fighter in every sense of the word. You won't be able to put down these books about a growing love between Aria and Braith, and their fight to bring their worlds together. If I could I would give this series 10 stars!! This series held me captive!! I couldn't put it down. I loved the character development and the story line. From the moment I started reading it, I was hooked. I never really found myself to be a big reader until I stumbled across a fantasy series a few months ago that I just couldn't put down. I had been in search of a new series to start and I came across this. I fell in love, I found it so good that I couldn't put it down at all, I ended up reading book 4 in about 24 hours. I was concerned with book 5 at first but it turned out great too, I can't wait for 6.